In January 2011, the National Symphony Orchestra (Washington, D.C.) and its new Music Director Christoph Eschenbach will make their first recording together, to be released on the Finnish Ondine label internationally on 31 May 2011 (ODE 1190-2D). The live recording will feature the concerts which the National Symphony Orchestra will perform during the Kennedy Center's celebration of the 50th anniversary of U.S. President John F. Kennedy's Inaugural. The repertoire will include Peter Lieberson's new composition Remembering JFK (An American Elegy), with Richard Dreyfuss narrating excerpts from the speeches of President Kennedy. Additionally, Bernstein's Fanfare for the Inauguration of JFK and Symphonic Dances from West Side Story will be recorded, as will the Gershwin Piano Concerto in F major, with renowned American pianist Tzimon Barto as soloist. This recording marks one of the highlights of Christoph Eschenbach's inaugural season as Music Director of the NSO and Music Director of the Kennedy Center. 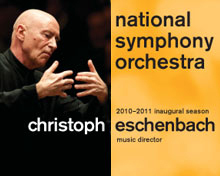 Christoph Eschenbach and Ondine have maintained a fruitful recording partnership for seven years, resulting in 19 CD and SACD releases featuring The Philadelphia Orchestra, the Orchestre de Paris, the NDR Sinfonieorchester, the Philharmonia Orchestra, and the Curtis Symphony Orchestra. The National Symphony's first commercial recording in ten years is made possible in part by an award from the National Endowment for the Arts. Peter Lieberson's Remembering JFK was commissioned under the auspices of the John and June Hechinger Commissioning Fund for New Orchestral Works. The recording will also include a bonus CD with excerpts from the broadcast of the 19 January 1961, Inaugural Concert by then-Music Director Howard Mitchell and the National Symphony. At the Kennedys' request, the Inaugural Program emphasized American composers, and the excerpts selected include John La Montaine's Overture From Sea to Shining Sea (commissioned by the NSO specifically for the Inaugural Concert), the first movement from Randall Thompson's Testament of Freedom (with the Georgetown University Glee Club), and Rhapsody in Blue with piano soloist Earl Wild. Additionally, the bonus CD will include some of the 1961 commentary by Mutual Broadcasting Network. The concert was broadcast live, and Washington was in the grip of a snowstorm that paralyzed the city, and the Mutual Broadcasting announcers rose valiantly to the challenge. Music Director Howard Mitchell walked a mile and a half to Constitution Hall, slogging through the snow to reach the performance venue. The Kennedys, too, were late, and some participants in the concert were unable to reach Constitution Hall, including the NSO's Concertmaster Werner Lywen, guest violinist Mischa Elman and the Howard University Choir, who would have also sung the Randall Thompson work. For more information, visit the website of the National Symphony Orchestra.